U.S. Secretary of State Mike Pompeo holds a joint press conference with Egyptian Foreign Minister Sameh Shoukry at the ministry of foreign affairs in Cairo, Egypt, Jan. 10, 2019. U.S. Secretary of State Mike Pompeo said Thursday that although the United States is withdrawing its forces from Syria, it remains committed to fighting Islamic State militants and preventing the group from growing. "We are going to do it in a way in one particular place — Syria — differently," Pompeo said. "The United States' decision — President Trump's decision — to withdraw our troops has been made. We will do that." He spoke to reporters alongside Egyptian Foreign Minister Sameh Shoukry after the two held talks in Cairo. Pompeo pledged that the United States "will remain a steadfast partner in the region for Egypt and others," and urged every country to take action to "crush terrorism." He also continued U.S. pressure on its allies to take action to push Iran to change its actions. "We discussed the need to counter the greatest threat of all in the Middle East, the Iranian regime and its campaigns of terrorism and destruction," Pompeo said. The top U.S. diplomat also met Thursday with President Abdel Fattah el-Sissi, and afterward pledged U.S. commitment to protecting religious freedom and fighting terrorism in the Middle East. Pompeo is due to give an afternoon speech about the U.S. relationship with the Middle East in the Trump era, with what the State Department says is a focus on "commitment to peace, prosperity, stability, and security" in the region. He is on a week-long trip to the Middle East, where in addition to urging governments to try to make Iran alter its behavior he is also giving reassurances about U.S. counterterrorism efforts as the United States prepares to withdraw its troops from Syria. Before traveling to Egypt, Pompeo made unannounced visits Wednesday to Irbil and Baghdad in Iraq. "A common understanding that the battle against Daesh, to counter Daesh, and the fight to counter Iran is real and important," Pompeo told journalists before leaving Irbil, referring to Islamic State militants. Pompeo met with top officials from the Iraqi Kurdistan Regional Government after his meeting with senior leaders of the Iraqi government. "Real progress has been made since the elections in Iraq, which I think will put this country and this region in a far better place," Pompeo said, adding the United States would continue to work with all parties to ensure democracy in Iraq. The State Department said the United States emphasized its commitment to "addressing Iraq's security challenges, including the continuation for our security partnership with Iraqi Security Forces." Pompeo's visit to Iraq followed U.S. National Security Advisor John Bolton's visit to Turkey, where President Recep Tayyip Erdogan refused to meet with Bolton. Erdogan dismissed Bolton's calls for the protection of the Syrian Kurdish People's Protection Units (YPG) as a precondition to a U.S. troop withdrawal from Syria. The YPG is a crucial ally in Washington's war against Islamic State militants, but Ankara considers it a terrorist group linked to an insurgency inside Turkey. On Wednesday, Pompeo said Washington and Ankara continued to have conversations about the U.S. troops withdrawal while completing "the mission of taking down the last elements of the [IS] caliphate before we depart." While acknowledging the threat that Turkey is facing from terrorists, Pompeo said the United States wanted to make sure the Syrian Kurdish fighters are protected. 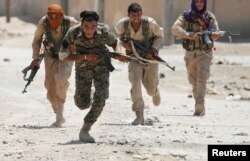 FILE - Kurdish fighters from the People's Protection Units (YPG) run across a street in Raqqa, Syria, July 3, 2017. "It's important that we do everything we can to make sure that those folks that fought with us are protected and Erdogan has made commitments," said Pompeo, adding Erdogan has used "the language that he has no beef with the Kurds." Pompeo's trip comes after U.S. President Donald Trump's abrupt announcement last month that he will pull all 2,000 U.S. troops from Syria, causing alarm among U.S. allies in the region. A recent report by the Washington-based Center for Strategic and International Studies (CSIS) pointed out the U.S. National Defense Strategy under the Trump administration had outlined a move from counterterrorism measures against non-state actors like al-Qaida and Islamic State to security and economic competition with states like Russia, China, Iran, and North Korea. The report, led by its director of Transnational Threats Project, Seth Jones, said that while these countries present legitimate threats to the United States, declaring victory too quickly against terrorism and then shifting too many resources away from counterterrorism would be very risky. Pompeo began his trip Tuesday in Jordan where he pledged to redouble diplomatic and commercial efforts "to put real pressure on Iran" to change what the Trump administration has said is a number of malign behaviors in the region. Other stops on Pompeo's trip include Bahrain, the United Arab Emirates, Qatar, Saudi Arabia, Oman and Kuwait.